“A mental health trust planning to close beds has spent more than £1m sending patients to a private hospital linked to one of its senior consultants. “The trust said it spent £1,180,290 placing seven patients with Milestones during 2013. The campaign voiced concern about the possible potential of a conflict of interests with his role at Milestones, suggesting it “undermines the ‘radical redesign’ consultation, given his role at the heart of it”. 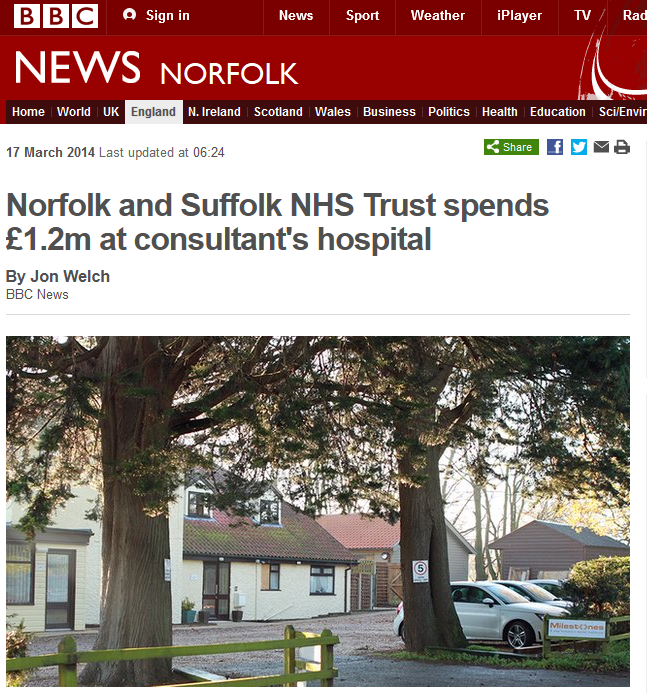 It called for a “thorough investigation” of the trust’s spending on specialist placements. “It is imperative that all NHS staff are working exclusively and transparently for the NHS, particularly those such as Dr Beezhold with senior managerial and clinical responsibilities,” its spokesman said. He questioned whether CCGs (clinical commissioning groups) and other bodies had known about Dr Beezhold’s involvement with Milestones when he presented evidence to them. “Jeff Keighley, of Unison, said any trust employee with contracts for private services within the trust should be forced to declare this when appearing before a scrutiny committee. “I urge county councillors, CCGs and the trust to review this and ensure full transparency is achieved,” he said. Click the image below to read the full article on the BBC. Let us know what you think in the comments selection below or contact us if you have more information. Sickened to the stomach. That is all. Is any of the same going on in the psychogeriatric sector? This is disgusting. Dr Beezhold’s role at Milestones is well known within the trust. It is registered, as the full article (conveniently edited here) states, which means it is already fully available public knowledge to anyone who wishes to know. It has been scrutinised by the trust. It is a highly specialised unit for a very specific patient group, so a greater demand for general acute beds would not impact on it. Most importantly, like any other specialist placement made by the trust, agreement for funding is made by a panel of senior trust managers, entirely independently of the care team i.e. Dr Beezhold does NOT decide that anyone will be placed there. Whatever one’s opinion on this fully disclosed and recognised conflict of interest, it is one that has existed for over six years, and making “news” of it now smacks of an attack on an individual, rather than addressing the ongoing endemic issues within the trust. DOI: I am not Dr Beezhold, I have no interest in Milestones or any other private facility, and I strongly believe that the chronic underfunding of mental health services is a disgrace. Dr Beezhold’s role at Milestones and the level of NSFT expenditure at his hospital, more than one million pounds per annum, was not known to the democratically-elected councillors whose job was to scrutinise the ‘radical redesign’ and bed closure programme when Beezhold appeared before them and backed the proposals. The Milestones referral criteria do not look very specialist at all and as NHS beds are closed more and more placements will become ‘specialist’. The BBC, the Independent and councillors all thought this is an important issue. I’d be inclined to agree with them. Women – 49% of the population discounted. Detained under the Mental Health Act – 60% of that population discounted. Failed to be discharged (the reality of the euphemistic “failed to flourish) from acute services – over 95% of the population discounted. Milestones is a specialist service because most people, whatever their diagnosis, would not go there. Treating mental illness in a purely diagnostic fashion is rarely helpful. And just because they wouldn’t exclude people based on diagnoses does not automatically make them “not very specialist.” Treatment resistance in mental illness is a hugely complex, hugely challenging problem. And my point was that the “democratically-elected councillors” only didn’t know because they didn’t bother to find out. I know, and I have no democratic role in scrutinising the trust, like these people have. Do you know every interest of those councillors? Or your local MP? And if not, do you suggest they announce them every time they speak? For me this isn’t personal, in the sense that I assume practitioners are in their roles for all the best of reasons and motives i.e. to help people in mental distress. I have practised as a Clincian in training and have also found myself on the receiving end of treatment. This is about transparency and processes. It’s obvious to me that you are aware of these processes and the relevant information, but this information was not known to many patients and service-users or indeed the Health Scrutiny Committee. Asking ‘the question’ is not ‘disgusting’, but I agree that any personal bent is not appropriate here. However, someone is responsible for the lack of transparency otherwise the questions would not be being asked. You cannot ask ‘the right’ questions, if you are not in full possession of the facts. Juggling two hats will invariably open a person up to scrutiny and rightly so and I would venture it’s never wise to place yourself in a position in which you are intimately involved in two perceived ‘competing’ camps. Any NHS practitioner who also holds a position from which profits have to be made for your private organisation to operate, will have a very difficult juggling act indeed, particularly if, on the surface, your organisation appears to have financially benefitted from NHS referrals….whether you were directly involved in those referrals or not. Underfunding may well be an issue, but it is totally immoral to make a profit out of people’s mental distress. How many other senior clinicians have spotted a “gap in the market” and are positioning themselves to line their own pockets? How can people with registered private interests find the time to do all this private work on top of their supposed full time NHS hours. I’d ban all private practice. May be nothing illegal has happened, but surely immoral. In what way is it less moral to offer private services for mental health conditions then it is for physical conditions? What is really immoral is the degree of underfunding for mental health and the shameful absence of treatment for the majority of people with mental health problems. If I had timely access to appropriate good quality treatment in the NHS, I could not care less if somebody else would decide to seek or offer private treatment. On reading the Milestone Website I am wondering what it is that they offer to ‘women who have failed to flourish within mainstream NHS settings? A nicer environment? Better staff morale? Coherent intensive treatment packages which do not exist in the NHS? I don’t know, but if it works it should be available in the NHS and if it doesn’t the panel of senior trust managers have a lot (1.2 Mill) to answer for. It’s immoral to make a profit out of physical illness too. Health isn’t a commodity to be bought and sold its a basic human right. The disintegration and running down of the NHS paves the way for a few individuals & corporations to trouser tax payers money. So many private providers are doing very well out of the dismantling of our services; temporary staffing agencies, private ambulance companies, consultancies & private hospitals. Imagine what a world class service we could provide if all that money stayed in comprehensive preventative community services able to provide intensive support and a well resourced crisis team. It’s public money that has paid for training & development of staff. Why should that public investment be exploited for profit? What you say about lack of timely access to good quality healthcare is key and that if it works it should be available on the NHS. Looking at the Milestones website and its referral criteria, it appears that Milestones will take virtually any patient as long as they are female which is hardly specialist (schizophrenia, bipolar, personality disorder, schizo-affective disorder, depression, dual diagnosis, mild to moderate learning difficulties, formal or informal). £1.2 million is an enormous sum of money to spend on something which doesn’t look very specialist but does look very expensive. This opens up the whole question of specialist hospital placements; if you remember when this Campaign started the Trust denied that there was a crisis and claimed that most Out of Area admissions were placements in specialist hospitals; this of course has now been exposed and even the Trust now admits that there is a serious bed crisis.To my mind there has never been a proper service for people with personality difficulties. Similarly, it is a disgrace that mothers with post-natal depression or psychosis have to be admitted hundreds of miles away from Norfolk, separated from their other young children and family support. Similarly with adolescents or those with Eating Disorders. ONe would have thought that now these two huge areas of Norfolk and Suffolk are combined we could make provision within our borders for so-called specialist placements; soon acute psychiatric illness will be a specialist provision. If there is a national shortage of beds surely the first Trust to start opening up wards will make a fortune from other Trusts! Much better however would be some regional strategic planning for need rather than the competitive, business model of putting services out to tender. There again nobody would make a profit then. Psychiatry is a pseudoscience, a drug racket, and a means of social control. It’s 21st Century Phrenology with potent neuro-toxins. All of the bogus “diagnoses” in the DSM-5 were INVENTED, – not “discovered”, – as excuses to $ELL DRUG$. So-called “mental illnesses” are exactly as “real” as presents from Santa Claus, but not more real. Real people have real problems, but thanks to the Stalin-like “Mental Health Act”, and human-rights violations called “sectioning”, all across benighted England, millions are kidnapped, drugged, and yes, TORTURED, all in the name of “mental health care”. But relax, things are little better here in America….